The European Champions Cup match between Oyonnax and Ulster in France on Saturday has been postponed after terrorist attacks in Paris. Nearly 130 people were killed in a series of attacks on Friday night. The decision to call off the Pool 1 opener was made just over an hour before the scheduled 13:00 GMT start. "A massive thanks to our supporters who have travelled for the game. Our thoughts are with the people of France," said Ulster Rugby. The postponement was made by European Professional Club Rugby (EPRC) and a newdate for the fixture has yet to be confirmed. "We fully support the EPRC in this decision - a difficult one and that's why it took a number of hours on Saturday morning to make it," said Ulster manager Bryn Cunningham. "However, rugby is fairly insignificant in all of this. 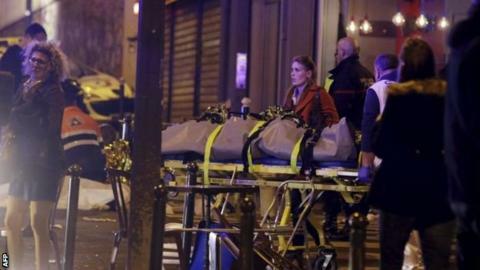 "Our thoughts, prayers and sympathies go out to the French public."